The programme focuses on study, design, development and evaluation of novel user interfaces and interactive systems which take into account human cognitive and sensory-motor responses and how these influence both technological and business requirements. The programme is interdisciplinary with courses on design and evaluation of interactive systems and a strong emphasis on user-centred design techniques. It is important to understand human responses to and consequences of using information technology as a tool for solving work-related tasks and in product development. Located in a world-level design capital, Politecnico di Milano is a vibrant meeting point of different cultures, linking design, architecture, and art, with technical, scientific and engineering studies. Polimi offers a highly qualified entry-point program for the HCID master that benefits of the synergy between the Design School and the Information Engineering School. These institutions have a tradition of excellence in multidisciplinary education, fundamental and applied research, knowledge transfer towards industry, and innovation. In their respective areas, the Design and the Information Engineering Schools rank as first within Italy and are within the top-10 in Europe (QS Ranking 2017). a thematic I&E Summer School (4 ECTS), in common with all entry points. I3Lab (Innovative Interactive Interfaces Lab) is a multidisciplinary research group, led by Prof. Franca Garzotto, including students from the Master and Doctoral Schools, Research Assistants, and external consultants, with heterogeneous backgrounds – software engineering, human-computer interaction, psychology, and design. One of the aims of our research is to focus on children with special needs, in order to promote social, emotional and intellectual benefits. Read more about projects and innovative interactive technologies which are currently being developed by the i3Lab at Polimi: http://i3lab.me/. The following summarizes the program for the first year (60 ECTS total). Please notice that, on the basis of the curriculum of previous BSc studies, the Admission Committee at Politecnico can specify some directions on the individual study plans, regarding the choice of courses to be attended. The Summer School brings students together for two weeks to work in groups on a business modelling and planning project in the context of a societally relevant thematic area. Summer Schools take place at different locations throughout Europe, supporting a multidisciplinary and international dimension, with a clear EIT Digital flavour to education. During the second year, students have the option to specialise in one of the technical areas that are offered by the Exit Universities. 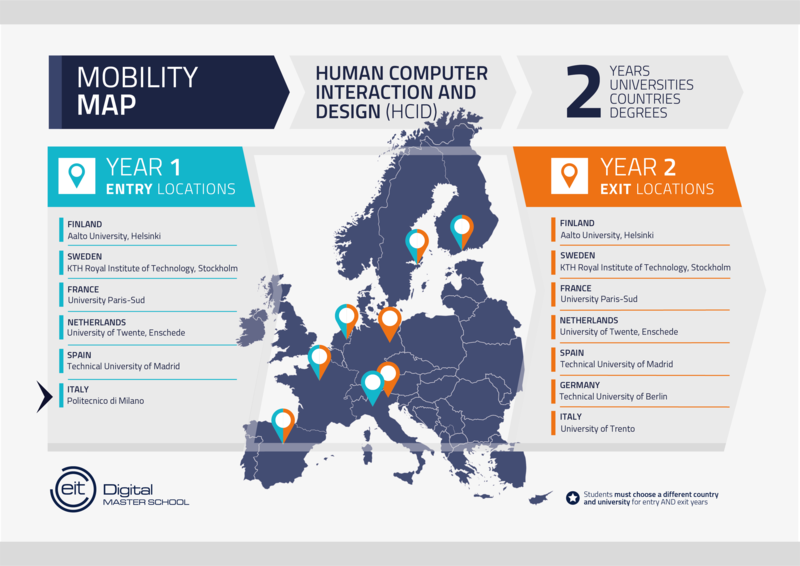 Please, refer to their local programs for the second year or find them out on the EIT Digital Master School webpage for Human-Computer Interaction & Design. The HCID major is a study track within the Polimi’s degree programme in Computer Science and Engineering (M.Sc.). Therefore, this entry university is best suited for applicants with a bachelor degree in Computer Engineering (or equivalent programmes). This means a strong base of ICT, computer science, programming and engineering courses in your transcript of records, including math courses at academic level (e.g. calculus, discrete or stats) and physics. 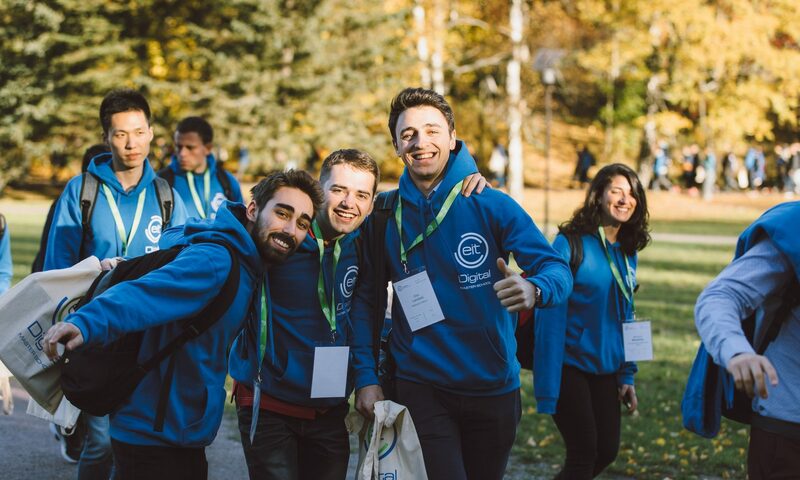 Politecnico di Milano is partner of the EIT Digital Master School.